The Click-Up Belay Device, made by Climbing Technology, marks a new era in the vast world of sport climbing belay devices. 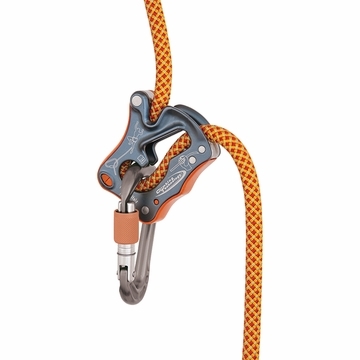 With the characteristics of both tube and assisted braking style devices, The Click-Up pays out rope and takes in slack smoothly while ensuring the climber’s safety in the event of a fall. The Click-Up utilizes a design that allows the belay-biner to move into a position that stops the rope from running through the device after it has been weighted. The belayer can easily control the speed of the rope while lowering the climber just by the amount of pressure they apply on the body of the Click-Up. Especially suitable for beginners.